Li Jin is one of the most important China’s traditional brush painters working today. He draws from the tradition of Chinese literati painting to create thoroughly contemporary works dealing with the banality of everyday life. 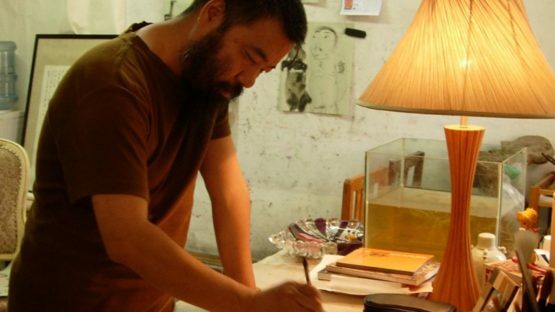 Li was born in Tianjin and he is one of the best-known and most unorthodox ink painters in the so-called New Literati group. Before his study in the Painting Department at the Tianjin Academy of Fine Arts, Li trained in dyeing and weaving at the Tianjin Academy of Arts and Crafts, which partly explains his mastery of pattern and color. He specialized ink-wash and gong-bi figure painting. Li’s signature expressionist facial features demonstrate his unparalleled brushwork skills. He gradually formed his uniquely playful style in the early 1990s, and is now famous for his seductive depictions of the good life. In contrast to the formality and stereotyped subjects of historical literati art – often derived from famous texts, pictures by earlier masters, or both – food and wine and the sample things in life are Li’s subject matter. The falstffian figure that appears repeatedly in his work is modeled on himself, and the flirtatious, enticing young women are artist’s ideal of female beauty. His paintings are populated with imperfect characters going about their daily life: eating, bathing, reading, even sitting on the toilet. Recent images emphasize the carnal desires of humanity through banquet tables heaving with meat and the voluptuous forms of the naked women and men that surround them. In this time of a market economy, he centered himself in a life of consumption. He seemed in love with it and enjoyed it, sympathetically experienced it, but also ridiculed it. There were many women and feasts, joys, miseries, loves, sensual desires, and comedy in his paintings. He kept the Bi-Mo tradition, painted in the way of traditional ink painters – tinted ink or color, drew fine lines, filled colors, and wielded his brush with facility and freedom. Although many New Literati painters introduce vernacular inscription in their paintings, Li Jin was especially audacious in inscribing the whole menu as a background for his painting holiday. The universality of his themes and the humorous way in which he treats them has made Li Jin’s work immensely popular, and his profile has grown significantly since he began exhibiting in Sydney in 2000. He is currently teaching Chinese painting at the Tianjin Academy of Fine Arts, which is one of the preeminent centers of current literati painting. Li Jin lives and works in Tianjin, China.